I perfectly understand: this disease is not simple. If you suffer from fibromyalgia, you have muscle aches throughout your body. There are about 18 typical pain points, and at times, the pain migrates between the various points, and sometimes it appears in some of them at the same time. The pain is so severe that it interferes with the patient’s daily functioning, such as a lack of sleep and a lack of motivation for daily functioning, memory loss, gastrointestinal damage and irritable bowel syndrome. Some sufferers also report symptoms of depression and anxiety. Western medicine has not yet found an unequivocal reason for the phenomenon, and there are many hypotheses about the phenomenon, including lack of absorption in the thyroid hormone, sub-activity of the adrenal glands, psychological problems, mental traumas, and severe infectious diseases, especially long and hard ones like mononucleosis. The conventional treatment given to fibromyalgia patients today is symptomatic therapy only: various steroids, various pain pills and even medical cannabis. It is certainly possible to understand the distress and the helplessness. What Help Can HTM Healing Offer ? Can we help alleviate the pain and let the patient deal with the disease better? 1. Pain reduction: HTM therapy can significantly improve the daily life of fibromyalgia sufferers, relieve pain and release muscle perception and tension and reduce the psychosomatic cause of pain, if there is one. 2. Improving the mental state: Playing the tuners using the HTM method can help to significantly improve the patient’s mood, improve the mental state, and increase the vitality of the patient. 3. Digestive system: Prolonged treatment with a music therapy kit can help to cure gastrointestinal problems and irritable bowel syndrome. The most appropriate treatment plan for general fibromyalgia healing for a general patient (in a specific patient, many changes can be made to adapt to the patient’s personality and problems) is comprehensive to help ease the pain and accompanying symptoms. We start with the Joy melody at the first session to open the patient’s ability to contain the healing frequency of the HTM method and healing in general.Fibromyalgia patients responded with a strong response to the melody. Some showed resistance to playing and even some nervousness, but all reported symptom relief as soon as the melody was finished and even while listening to the melody. The second session will begin with the melody Joy in order to open the healing frequency. After listening, we will conduct a short questioning and later on, we will play the melody of the tune Silk, which belongs to the element of air. The frequency in the melody of Silk is very gentle and caressing, but the intensity of its healing frequency and its effect are very strong. Many patients tell of many changes in their condition after a session of healing with this melody. The tune Silk is mainly suitable for assisting in the healing of pain and illnesses that are psychosomatic; it is especially suited to help fibromyalgia and similar problems. In the third session after the opening melody (Joy), we will play Sunrise to connect to the charging source of cosmic energy and recharge the patient’s batteries. In the fourth session after the opening melody, we will play King David. In the fifth session, we will play Sky Light to treat infections. In the other sessions, we will play the remaining melodies to complete a complete cycle of treatment and balance. In any event, if there is a strong response to the treatment of Silk, it may be played more often during the treatment program. You can also play the melodies in a different order. If you want to walk on the safe side and take it a little slower in order to ease the body’s reaction, you can consider playing Soul Voice. It has a wonderful relaxing effect, and it will help to improve the mental state and prepare for a healing session with the tune Silk. In the course of treatment with fibromyalgia, it is recommended to combine a comprehensive nutritional treatment with a naturopath and to thoroughly address nutritional issues. 1. Reduce the use of salts and monosodium glutamate. 2. Avoid junk food and instead eat fresh food rich in vegetables, beans and nuts. 3. It is recommended to take omega 3 regularly. 4. Stop using milk and dairy products. 5. Avoid artificial sweeteners completely. Tension should be performed gently and with great patience. Some yoga exercises can help you very much; just be patient. 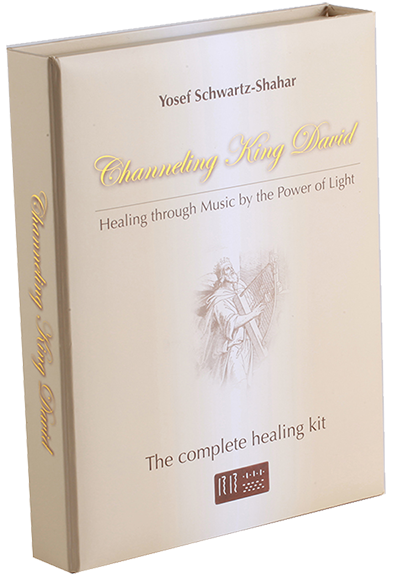 Some more information about therapy with the Healing Through Music – HTM method is found in the Channeling King David handbook, the complete HTM healing kit.